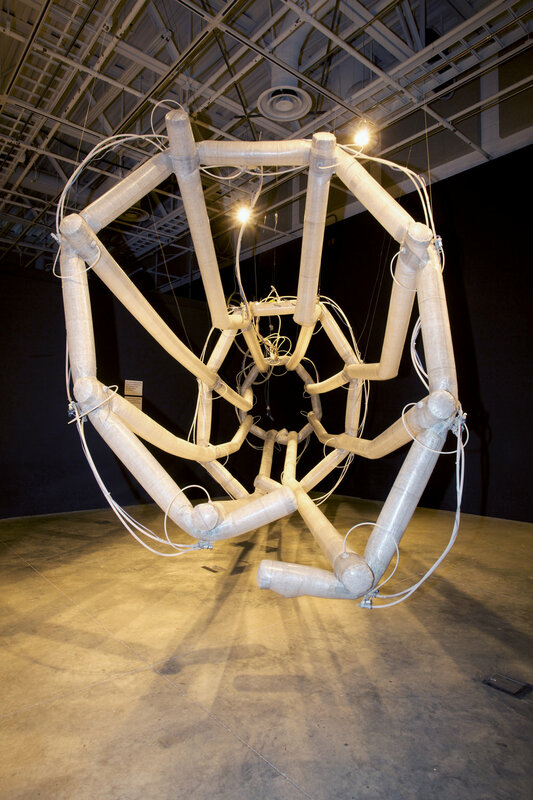 Inner Space, the third installation in the series of Inflatable Architectural Bodies, brings the audience inside the workings of the inflatable machine environment. It shifts the boundaries between interior and exterior, and between art and audience. 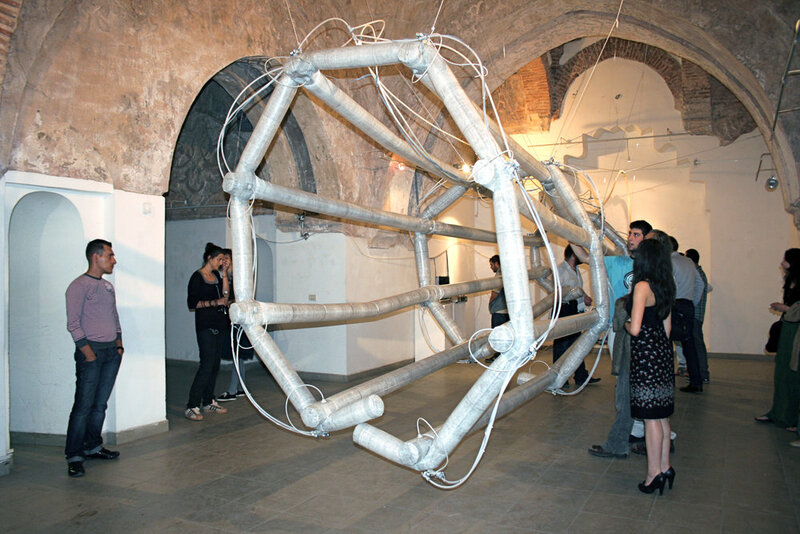 Inner Space comprises an inflatable robotic structure that forms a capsule-like space made of interconnected tubes. Designed to be installed in a physically accessible location, it allows visitors to experience the kinetic transformation from inside or outside of the capsule. The octagonal opening allows the audience to enter inside as the tubes fill with air to form a suspended enclosure. Alternately, Inner Space can be installed in a vertical configuration several meters above the floor, forming a cornucopia-like dome that lifts the viewers’ gaze up into its inner structure as it tenses and relaxes. 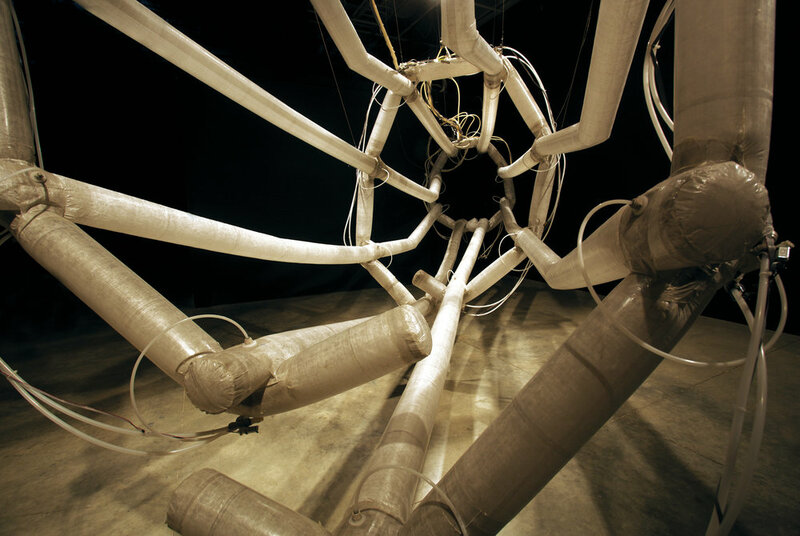 Inner Space is part of an ongoing exploration of living systems, machines, and architecture. 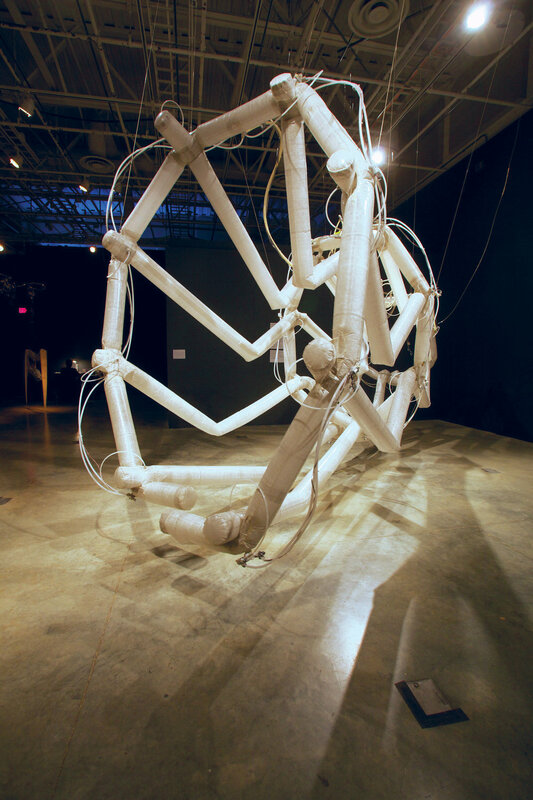 Like the other Inflatable Architectures, it explores the physical and metaphorical commonalities between what we build and what we are made of on a molecular level. The movement of Inner Space is analogous to that of organic muscle and bone, animated by the slow rhythm of breathing. The expanding and contracting of the inflatable tubes could be compared with a rib cage, in which musculature is wrapped around bone, or with other internal organs enlarged to an unfamiliar scale. Inner Space evokes the magnification of a microscopic living system that moves in response to visitors’ presence. The sculpture thus transforms the surrounding space not only in form, but also in scale, engaging the mind and body of the viewer as she is surrounded by the sculpture. 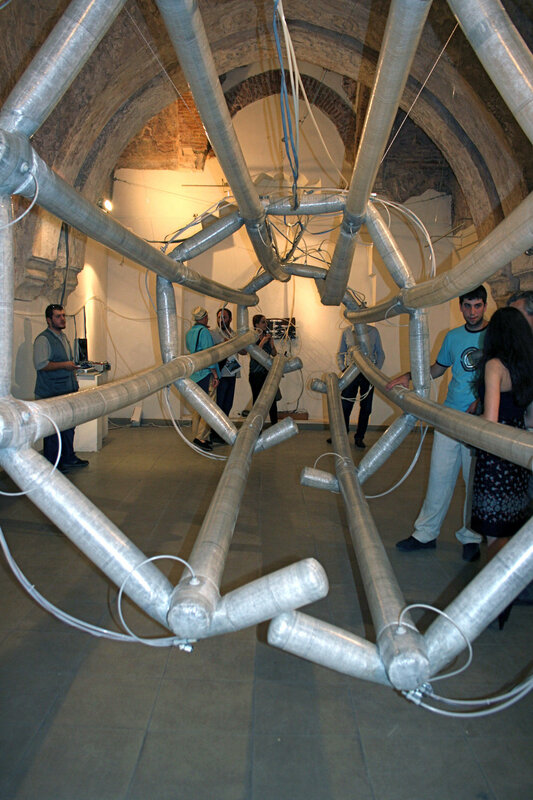 Inner Space was first exhibited in 2010 in a solo exhibition curated by Dr. Melentie Pandilovski at the National Gallery of Macedonia—an ancient hammam converted to a museum in Skopje, Macedonia. 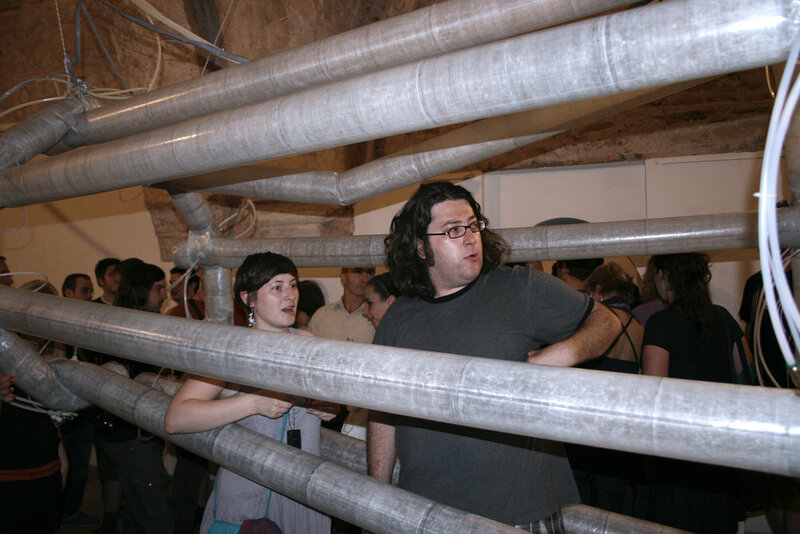 Inner Space was conceived, manufactured, assembled and programmed by Chico MacMurtrie and the crew and interns of Amorphic Robot Works, in conjunction with workshop participants in Skopje, Macedonia in 2010.